Summer is right around the corner and the only way to really enjoy it is on the water. We have a 2014 20 foot Hurricane Sundeck available that only has 42 HOURS of run time on the Yamaha 150 horse four stroke outboard motor. The 150 pushes the boat nicely and is equipped with a stainless propeller. This is a nice boat, the finish and upholstery are in great shape. With lots of seating and an optional ski pylon this boat will be great for cruising and island hopping. A live well, rod holders, and forward seating also gives you the option of catching some fish on your way to the island. A freshwater washdown keeps the deck clean and a removable Porta-Poti means you can stay out all day. The boat is also equipped with a flush mounted GPS Chartplotter and a stereo system. 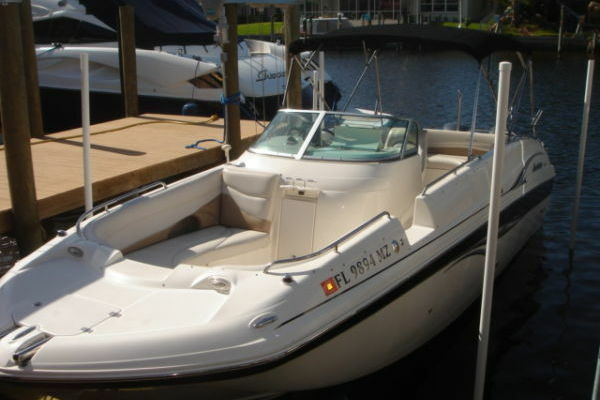 This is a super clean boat and the low hours on the motor will help to ensure years of fun. The boat has lived on a lift since new so it does not come with a trailer. United Yacht Sales New Jersey would love to guide you through a personal showing of this 20' Hurricane Sundeck 20 2014. This yacht for sale is located in Apollo Beach, Florida and priced at $26,900. For a showing please contact us by filling out the form on this page and we will get back to you shortly!